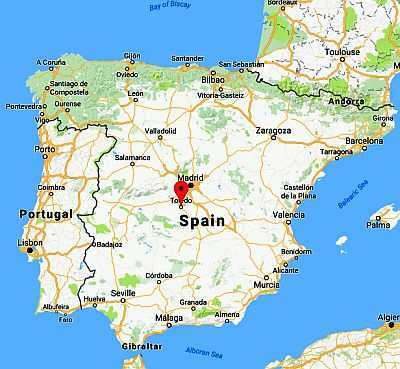 In Toledo, the capital of the autonomous community of Castilla-La Mancha, located at an altitude of about 500 meters (1,600 feet), the climate is transitional Mediterranean, with some continental characteristics, and semi-arid. The daily temperature variation is often high. In winter, mild periods alternate with cold periods, when night frosts, usually light, may occur. However, the characteristic feature of the climate of Toledo is the hot summer, with fairly frequent scorching periods, although the humidity is fortunately low. Precipitation is quite low, in fact it totals 350 millimeters (13.8 inches) per year, and in fact the landscape is arid, especially during the summer months. The rains, however, are quite frequent in spring and autumn. In May, and more rarely in summer, some thunderstorms can break out in the afternoon, but usually from June to August it almost never rains. Winter, from December to February, is fairly mild: the average temperature in January is 7 °C (44.5 °F). Rainfall, which is brought by Atlantic depressions, is not very frequent because of the distance from the sea, and usually it's not abundant as well. Days can be mild, particularly when the Azores anticyclone settles on the Iberian Peninsula, bringing periods of good weather also in winter, with highs around 15/18 °C (59/64 °F), but nights are usually cold, with lows around 3/5 °C (37/41 °F). Sometimes, cold waves, with snow and frost, can occur. A particularly cold episode occurred in January 2005, when the temperature dropped to -9 °C (16 °F). Summer, from June to August or mid-September, is hot and sunny; the average July temperature is 27 °C (81 °F). The heat is usually intense during the day, since the maximum temperature easily reaches 37/38 °C (99/100 °F), with peaks of 40/42 °C (104/108 °F), although the air is dry, so it is more bearable. At night, however, the temperature decreases in a remarkable way, so the heat almost always gives a bit of relief. Spring and autumn are mild and characterized by variable weather, in fact there are sunny periods but also Atlantic depressions, which bring clouds and rain. The amount of sunshine in Toledo is excellent in summer, when clear skies prevail: in July there are on average 12 hours of sunshine per day. Sunny days are possible throughout the year, but in winter the average drops to 4 hours per day in December and 5 hours in January. 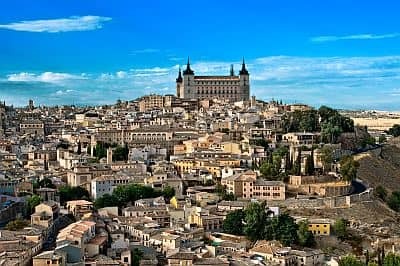 The best times to visit Toledo are spring and autumn, especially from mid-April to late May and from mid-September to mid-October. In June, it can get hot during the day, especially in the second half of the month. In April, it can still be a bit cold, especially in the first part of the month. September, too, is a good month, but at the beginning it can still be hot, while during the month the first rains may occur. In October, the air is often mild, however, the days get shorter, the rains are more frequent, and it can start to get a bit chilly at night, especially in the second half of the month. Those who can stand the heat can also choose July and August, but must be prepared to stroll around the city in hot weather. The temperature range between day and night is often high, so it is helpful to dress in layers and have available something warm: you may want a light sweatshirt for the evening even in summer.